Though present-day Darlington County was settled primarily by Baptists, that did not preclude Episcopalians from worshiping in the courthouse as early as 1844. While not a formal church until a few years later, by 1849 this burgeoning congregation had named itself Emmanuel Church. The church was served by itinerant preachers until regular services – as well as all aspects of daily life – were disrupted during the Civil War. About two decades after the war, a ladies’ sewing group persuaded an Episcopal priest, the Reverend John Kershaw of Sumter, to relocate to Darlington. When he agreed, the women raised the funds to purchase a lot on Grove Street for the construction of a church, which was built in 1888. The group, called the St. Matthew’s Sewing Guild, continued to raise money for the church, and by 1892 the group was able to expand its small sanctuary. In 1900 the church received a new priest, the Reverend Albert Sidney Thomas, who began a campaign for an entirely new church building. Under the leadership of Thomas, the congregation broke ground on its new church in 1905. 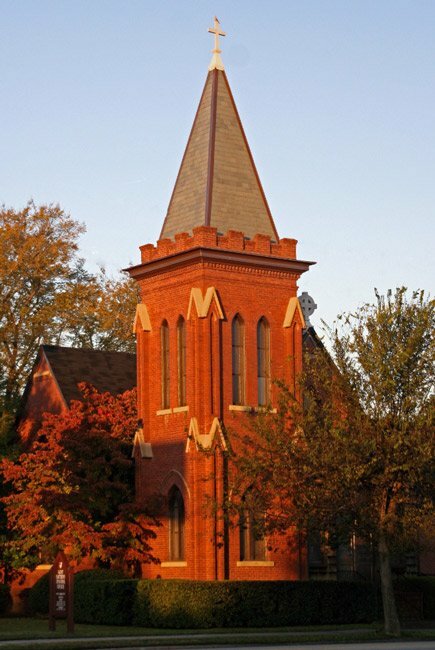 On April 15, 1906 – Easter Sunday – the Gothic-style brick edifice held its first service. The church has undergone additions to accommodate a growing membership over the years, all while maintaining the integrity of this historic edifice. Below is an article that was contributed to the South Carolina Picture Project by Bill Segars of Hartsville. It originally appeared in his local paper, The Darlington New & Press. It was published in May of 2015. Episcopal services were held in Darlington at the courthouse as early as December of 1844. This loose-knit group seemed to have problems organizing a strong congregation, but did name itself Emmanuel Church in 1849. Visiting preachers would come to town several times a year to hold services for interested citizens until the outbreak of the War between the States in 1864. After that, very little was normal, orderly, or regular; everyone seemed to be simply trying to survive. As life in the South begin to return to some degree of normality, the Reverend John Kershaw came to Darlington from Holy Comforter in Sumter at the insistence of several local ladies in November of 1886. These ladies, true to fashion, would not take no for an answer and immediately formed themselves into a sewing society with Mrs. Snowden as president and Mrs. Thompson as treasurer. Without a building of their own in the beginning, they busied themselves lining up different church buildings that would allow them to hold weekly Episcopal worship services. Their efforts and persistence paid off, as they soon raised enough money to secure a lot on Grove Street for a building. By late 1888 a nice little chapel had been built on the Grove Street lot for the cost of $625. The original sewing society, known as The St. Matthew’s Guild, continued to push for funds, as they held many fundraisers and worked insistently to furnish their beloved little chapel to transform it into a proper church building for its consecration service on January 17, 1892. As the congregation continued to grow, the need for more space soon surfaced, and two buildings on Florence Street were bought and put together for a larger rectory. On August 1, 1900, the Reverend Albert Sidney Thomas took charge of St. Matthew’s. Thomas was a much respected priest and was known in the Episcopal circles as a preacher who moved congregations forward and challenged them to improve their buildings. 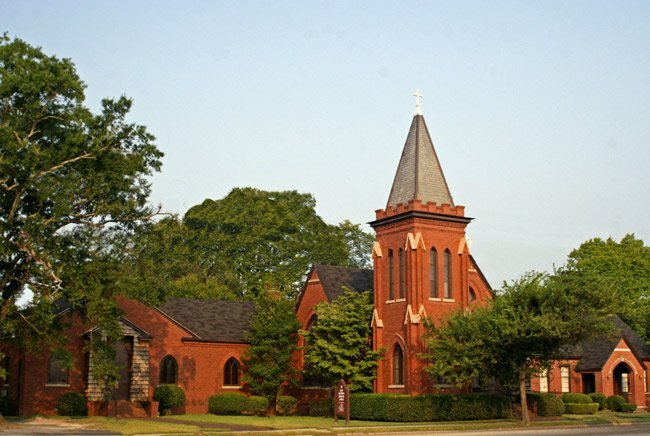 The timing was right for the growth of St. Matthew’s, as the town of Darlington experienced tremendous growth in the late 1800s and early 1900s. Plans were immediately set in motion to build a new edifice for the Episcopal community in Darlington. The young new architectural firm of Shand and Lafaye from Columbia was hired to design St. Matthew’s new building. Architect George Lafaye, originally from New Orleans, and engineer Gadsden Shand, a Columbia native, worked together for several years at the firm of W.B. Smith Whaley and Company, who designed and built many textile mills and mill towns in South Carolina. When the Whaley firm was dissolved in 1903, Shand and Lafaye were naturals to couple together in the new firm that would go on to develop a strong presence with many buildings still in use in South Carolina today. Shand and Lafaye stayed together until 1912, when Shand pulled out to form Shand Engineering Company. Even though Shand and Lafaye were experienced professionals in their own rights, St. Matthew’s took somewhat of a chance in hiring this untested team. All concerns were put to rest soon after the cornerstone was laid on May 31, 1905, as the present impressive Gothic, cruciform structure began to rise. As the public watched with interest, the solid brick building with concrete trim and slate roofing on Main Street began to take shape as a church building to be admired by all. The building, costing $7,000, was made ready for its first service on Easter Sunday, April 15, 1906, with the consecration service following on January 23, 1912. St. Matthew’s leadership and congregation have been very kind to their 1905 building over the last 110 years. Skilled Rectors have crafted alter furniture, members have shared their talents to improve the building, and memorial windows and furnishings have been donated by church members in honor of loved ones. A new parish house – very architecturally sympathetic to the original building – was built in 1956. After 1975 a new educational building was built, all for the expansion and service for a growing, thriving Episcopal congregation.